Centrionics - Centrionics is a certified distributor of world class analyzers. Our main office is located in Shah Alam, Selangor, Malaysia. 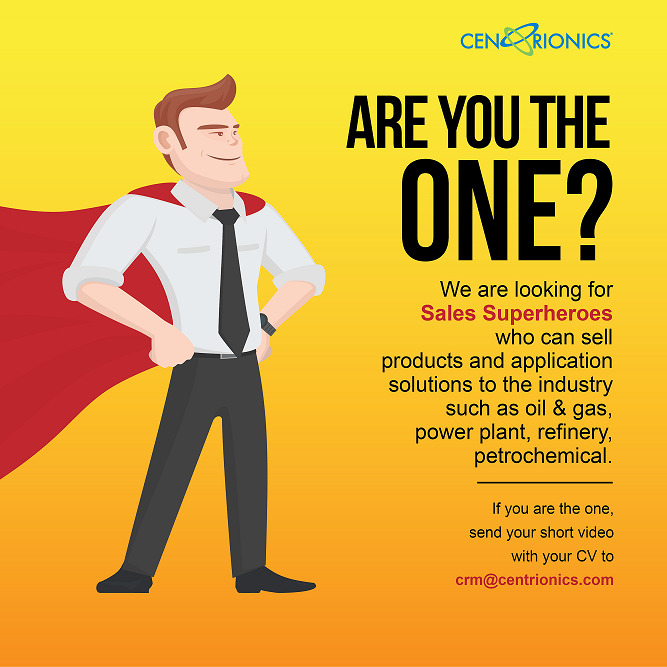 14-Jun-2018 We are looking for Sales Superheroes to join our team! 04-Jun-2018 Can your Analyzer provide you with accurate COD, BOD & TOC readings in under 10 minutes? Ours can! We specialise in Process & Analytical Instruments and Solutions, giving you the ability to measure the quality of your applications in the Petrochemical, Refinery, Semiconductor, Powerplant, Oleochemical and Environment-related industries. We embrace the latest analyser technology to enable process, safety and environmental monitoring solutions for our customers. Centrionics is an ISO 9001:2015 certified company and we are focused on meeting customer expectations and delivering customer satisfaction. - We are honest, open, ethical and fair in all aspects of our work. - We are accountable to our customers with a commitment to deliver beyond expectations. - We achieve our goals and objectives by collaborating and working together as one. - We identify, understand, anticipate and respond to each customer's needs and provide win-win solutions. - We are committed to consistently deliver the highest quality products and services. Block 5 Yishun Industrial Street 1, North Spring Bizhub, Unit 02-03, Singapore 768161.